Peruutusehdot: 2 viikkoa ennen kuluitta. 1–2 vko ennen tilaisuutta laskutamme 25% hinnasta, alle 1 vko ennen tilaisuutta peruutuksissa laskutamme 50% hinnasta. Esteen sattuessa samasta organisaatiosta voi kuitenkin ilman lisäkuluja osallistua toinen henkilö. Dr. Brian Van Brunt has worked in the counseling field for more than 20 years, and specializes in educational counseling, behavioral intervention and support, and issues related to mental health and alcohol/substance abuse by students. He served as Director of Counseling at New England College from 2001–2007 and as Director of Counseling and Testing at Western Kentucky University from 2007–2013. Brian teaches threat assessment at the University of Toledo and serves as the executive director the National Behavioral Intervention Team Association (NaBITA). 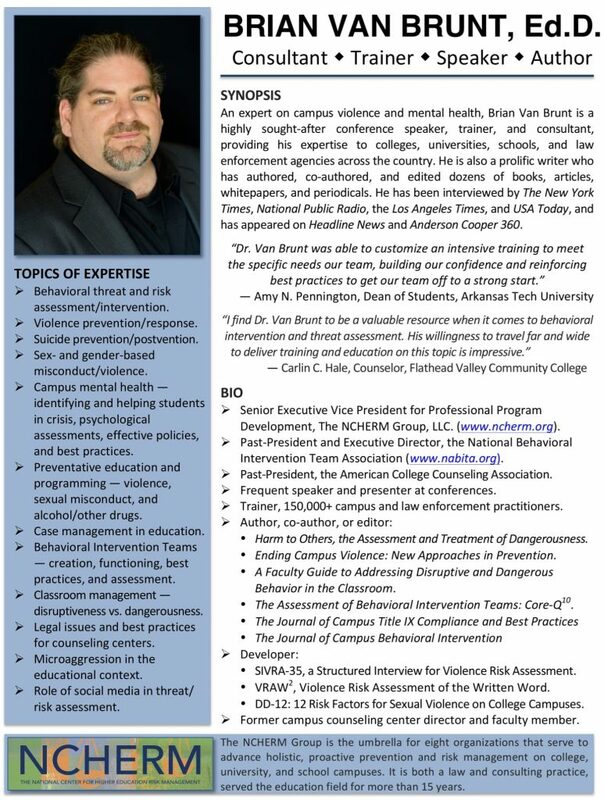 He is the managing editor for the peer-reviewed, academic Journal of Campus Behavioral Intervention (J-BIT) and is a regular speaker for academic conferences and training events around the world on topics of threat assessment, mental health and sexual violence prevention.